Early American Colonist used horizontal planks of wood to form a signature look, called Clapboard siding. This look is still emulated today and is one of the most popular vinyl siding styles out there. Each style is basically long vertical boards attached to the house. Each has a distinct profile or look. Each has it's own history. Click here to see all 4 styles of Clapboard Siding. Tell us why you picked Clapboard Vinyl Siding. Of all the different styles and types, what made clapboard the perfect vinyl siding for your house. Do you have some before and after pictures? Send them! Early American Colonist first cut down trees and used the trees or logs to build log cabins. Then as more and more homes were built, they started sawing logs into long thin strips of vertical lumber and used on their homes. This was an upgrade usually reserved for the wealthy. 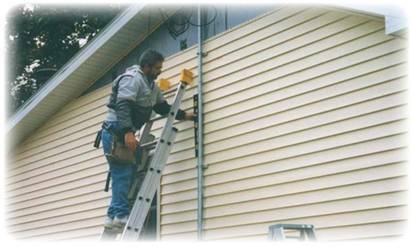 Today this style of siding is one of the most popular vinyl siding types used. If you have chosen Clapboard Vinyl Siding as your home siding, please tell us how you came to choose it, and if you have a before and after pic, please share it with us.